The Travel 1003 C delivers over 1,000 watts of input power and in terms of propulsion is comparable with 3 HP petrol outboard. Its name says it all. With the Travel 1003 C you can discover the world on water, completely waterproof to IP67. Both motors are suitable for inflatables and other small boats. The Travel 1003 C will also easily propel tenders, dinghies and sailboats up to 1.5 tons. with its integrated lithium batter and its outstanding efficiency, the Travel is the alternative to a small petrol outboard. The Torqeedo Travel's on-board computer calculates the remaining range constantly, by linking the motor's consumption data with the charging level of the batteries, and the speed over the ground from the GPS. This allows you to read the remaining range in real time from the motor display or the smartphone app TorqTrac. Which Travel for which boat? Both models are suitable for inflatables and other small boats. For sailboats up to 750 kg we recommend the Travel 503. The Travel 1003 easily propels up to 1.5 tons. Both models provide similar performance on the same boat at the same speed. However, the Travel 1003 has a higher maximum power and offers over 60% more battery capacity, providing longer range. The Travel 1003 C offers almost three times the battery capacity of the Travel 503. And when the battery is empty – how does it take until I can continue on my way? That depends on the solution you choose. You can of course take a spare battery with you, which will make you mobile again immediately. Or you can connect a solar charger (accessories) and charge while you're under way. Or you can charge from the 12 V on-board power system direct. Or you can connect the battery in question to an electric socket using the charger provided – it will take approx. 5 hours to fully charge a Travel 503, approx. 7 hours for a Travel 1003 and approx 10.5 hours for a Travel 1003 C.
Unfold or unroll the solar charger, apply its waterproof connector to the Travel and get started. 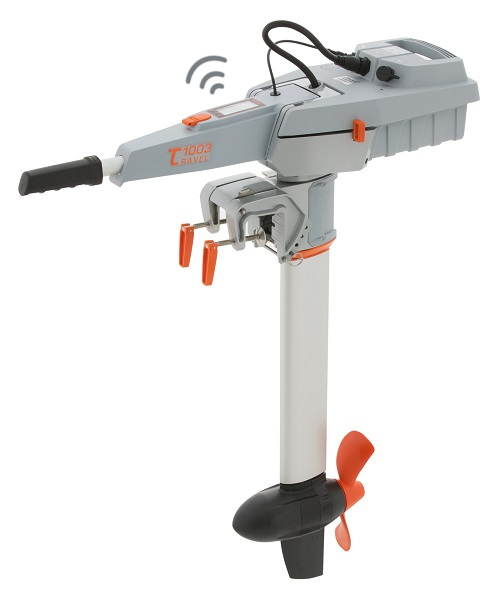 You can use it while being out on the water and while operating the motor or you can use it on land. Two different solar chargers are available for the Travel, depending on the model year. The life expectancy of lithium batteries in recreational use is, more or less, independent of charging cycles. There is no memory effect either, i.e. you can fully charge them after each trip, irrespective of the charge status shown in the display. Generally speaking, a capacity loss of approx. 4 % per year is to be expected. Capacity loss will, however, accelerate if the battery is permanently exposed to heat. Also storing the battery always fully charged will accelerate ageing. There are no concerns about using the battery in high temperatures, we recommend that you take the battery out of the sun and store it in a cool place after use. Heat – don't batteries suffer damage at high temperatures? until the temperature returns to a level where there is no risk of damage to the battery. This function is represented in the display with a thermometer. What power does the integrated battery provide? The Travel 503 battery has a capacity of 320 Wh, which means 11 Ah at 29.6 V.
For the Travel 1003 this means a capacity of 530 Wh delivering 18 Ah at 29.6 V and for the Travel 1003 C a capacity of 915 Wh delivering an impressive 31 Ah at 29.6 V.
With its emergency kill switch – very safe. The motor only runs when the emergency magnetic stop key is placed in the prescribed position on the remote throttle or tiller. The magnetic pin should always be attached to your wrist or to your life jacket. Should you fall overboard, the magnetic key will go with you and the motor will stop immediately. This prevents the risk of injury from the propeller under water.